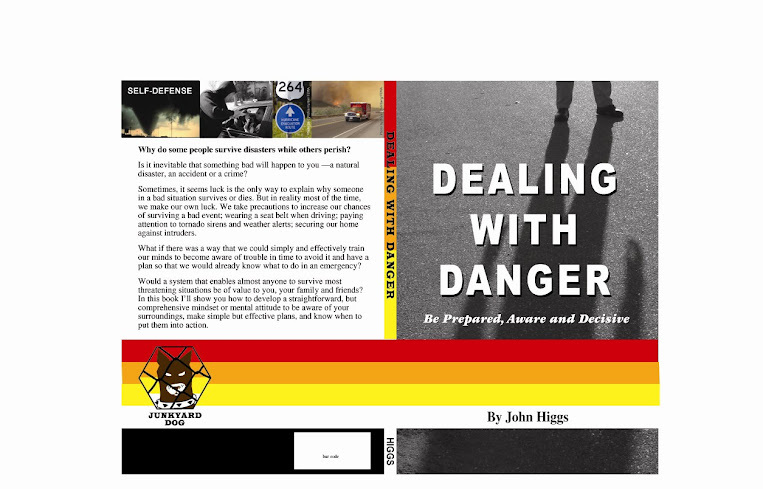 Now you can buy my book: "Dealing With Danger -- Be Prepared, Aware and Decisive"
It's an instructional book to show people how to develop a straightforward, but comprehensive mindset or mental attitude to be aware of their surroundings, make simple but effective plans, and know when to put them into action. You can read a preview of the book online. A lot of people say that we need to develop a warrior attitude, but that just doesn't work for everyone. In my book I'll show you, regardless of age, gender, background, physical ability, and especially attitude how to be better prepared to survive the bad events in life by becoming a junkyard dog. Just click here. Most people have at least one credit or debit card, and many people routinely carry them all. The obvious problem is that if a person's wallet or purse is stolen or if all the cards are stolen it's a huge headache to inform the various credit card companies and banks and it may be too late to avoid incurring the charges that a thief runs up on those cards. What is at least as bad is when the card owner does not realize for a long time that their card has been stolen. Thieves are now substituting similar-looking expired cards for the owner's original and it's likely the theft will go undetected until the next time the owner tries to use their card. 1. Every time you take your card out, look at the name on it to verify that it's your card and not some stolen or expired card. 2. Every time you hand your card to anyone, a store assistant, waiter or pizza delivery guy, check that the card they give back to you is indeed your card. 3. Don't leave your purse or wallet lying around where someone can switch your credit cards. 5. Finally, always keep a photocopy of each credit and debit card in a secure location so that you can quickly contact the credit card company or bank that issues the card with details. Sure, it's a pain to have to do all this, but as long as you have money or credit, someone is going to want to take it away from you. Video of me training with Louis Awerbuck, one of the very best tactical firearms instructors in the world (no, I'm not the blonde). Sooner or later, almost everyone is faced with some kind of bad situation. I’m talking about things like criminal attacks, natural disasters, car accidents…you name it and someone has experienced it. Some people have died or been severely injured, while others have survived. More than a quarter of a century ago, I began asking myself why some people survive events that others don’t; why some people resign themselves to becoming victims of some violent act of man or nature while others fight back and win. I realized that few people, if any, have all the answers and are able to survive every situation; but I also realized that there are some common rules or procedures that can increase the average person’s chances of surviving most things, most of the time. That seems like a big step forward in surviving our own lives for as long as possible. Because that is what we want to do; survive the events of our own life. We all die eventually, but what I want to explore here is how we might put off that final outcome for as long as possible, and give ourselves the chance to live our lives to the fullest extent. This blog is about finding ways to prepare and plan for, and hopefully avoid the kind of bad things that happen to people. 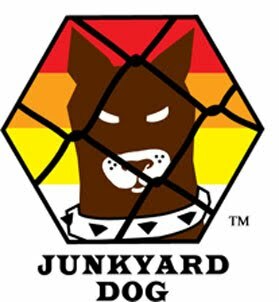 This blog is called The Junkyard Dog because it is a metaphor for the mindset that I believe anyone can learn in order to better protect themselves and their loved ones from the deadly threats that people have to face. Imagine an actual junkyard. It is an area where things that are of value to the owner and the customers are stored. A high wire fence with a gate surrounds the junkyard to define the boundaries and to protect the things inside. A junkyard dog guards the junkyard when it is closed. The junkyard dog is alert and watches people who pass by the junkyard without coming inside, but he doesn’t take action against them because he doesn’t have to. They are outside his boundary. But if they attempt to climb the fence, he acts. He barks and growls and persuades them to go away. If they persist in climbing over the fence into his junkyard he will bite them. If they escape back over the fence, he won’t chase them down the street because he has already done his job, and they are no longer in his space. The junkyard dog understands that the fence is a boundary and as long as people are on their side of the fence when they aren’t supposed to be in his junkyard, he is happy. 1. The junkyard dog is vigilant. 2. The junkyard dog will deal with any threat in the junkyard. 3. The junkyard dog will not pursue the threat outside of the junkyard. We can take this illustration and apply it to our own security. A person who lives near a river that bursts its banks from time to time, flooding the surrounding area, can decide that if the river reaches a certain height, they will head to higher ground. They don’t have to wait until the river floods before they decide to take action. They know that when that boundary (the river reaches flood level) is crossed it’s time to leave. This is what being a Junkyard Dog is all about: Being aware of our surroundings and knowing what to do when someone or something crosses a boundary that the junkyard dog has defined. A Junkyard Dog is Prepared, Aware, and Decisive.